Cloud technology solutions are one of the major trends in almost all industries. They provide multiple benefits and facilitate digital transformation processes in companies. They have become essential in the Contact Centre sector, since they allow the efficient storage of thousands of data that are generated every day and have easy access to them. In fact, up to 88.8% of customers agree that Contact Centre solutions in the cloud have allowed them to reduce costs, among other benefits. In the last few years, Cloud technology has become a concept present on the agenda of company directors and decision makers as this new process means a turning point on their work processes. these technologies are a reality on the market in which more and more companies are investing, regardless of the sector, due to the benefits they provide. Companies that have a Customer Service department are no strangers to this change, since they generate and process a large amount of information. This is why they are adapting their software to develop their activity on cloud. In fact, according to a study conducted by Markets and Markets, the Contact Centre market hosted on cloud was valued at 5.73 billion dollars in 2016 and it is expected to reach 20.93 billion dollars in 2022, experiencing an annual growth rate of 25.2%. Cost savings: for small and medium-sized companies, this is undoubtedly the most important benefit due to the significant expense that were required until now by legacy solutions. Cloud solutions do not require any initial investment. No specific hardware is necessary neither (except the PC and headphones) so the need for IT personnel for management and maintenance is reduced. Simple management: Cloud solutions enable businesses to manage the Contact Center platform easily without the need of IT help. In addition, the company will always have the latest software version in accordance with the latest data protection regulations. Lastly, call exclusion lists can be uploaded and real-time changes made in the active campaigns. Flexibility: the flexible subscription models allow the expansion or reduction of the Contact Centre platform size according to each company specific needs without having to pay for the non-used licenses during low seasons, or otherwise, easily increase capacities during peak seasons. Mobility: thanks to these solutions it is not necessary to establish a contact centre in each country or city where a company is present, beyond the corresponding legal restrictions. Also, a cloud platform allows employees to work from different locations without the need to acquire new telephony systems or specific hardware, enabling the remote work and increasing their motivation. Multiple applications: Cloud solutions allow the integration of numerous applications and functionalities into their platforms, facilitating the user access. Recently, Altitude Software has launched its application marketplace, Altitude Xperience Hub, to enhance its ecosystem of products and solutions and provide greater value to customers. Altitude Software, true to its commitment to offer innovative products to customers, has not hesitated to add cloud technology to its Altitude Xperience solutions, the interaction management software which helps companies to consolidate data effectively and establish and maintain relationships with your clients. There are multiple functionalities that companies who use Altitude Xperience cloud platform can benefit from, like the Xperience Routing. This application allows a simple and fast configuration, offering an improved experience to the client, transmitting personalized messages while they wait for an agent to be available, or giving them the possibility to return the call later if the waiting time to talk with an agent is too long at that time. The GDPR Portal is another innovative application included in the cloud platform, which helps to be compliant with the GDPR legislation when you manage personal data from your customers. All data is centralized in a single directory, facilitating the organisation by categories, as required by the legislation, as well as for audit purposes. These cloud platforms allow companies to address customer queries through different channels in a single virtual desktop, online and hosted on cloud. This improves agent efficiency and offers a 360-degree view of the well-known Customer Journey. CIOs must take advantage of the benefits provided by the cloud solutions, such as recording calls to have greater control over the service quality and to help contact centre agents improve their work, establishing KPIs and having a global view of the results in real time. Customer Service is essential for companies who put their customers in the centre, and therefore the innovation in this sector is key to guarantee the service quality in the future. The adoption of new trends and benefits offered by cloud technologies, involve a transformation looking into the future that allows us to easily adapt to the customer needs and requirements. 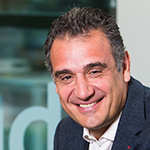 Julio Pérez is Executive Vice President at Altitude Software. Altitude Software is a global provider of omnichannel solutions to deliver great customer experiences. Its solutions help companies and organizations unify all customer interactions and become more customer-centric. Altitude Xperience solutions are a robust, modular software suite that handles all customer interactions and unifies all touch points, in the contact centre and throughout any organisation. More than 300.000 users in 1100 customers in 80 countries use Altitude solutions to manage in real time enterprise functions like Customer Service, Telemarketing, Debt Recovery; Help Desk; Citizen Attention, etc. Altitude Software has a track record of 24 years of customer and industry recognition and has won dozens of awards for innovation and tangible results with customers in key markets worldwide.